I’m sorry it has taken me so long to get this post up! I think I said in mid-August that it was going to be up in a week but then school started and time got away from me. But, behold, the long awaited sequel to Hosting a Perfect Party, part I (just in time for the holidays!). Be forewarned that this is a looooong post – sorry, I had a lot to say! When we left off, I had just finished sharing how Artie and I prepare for a successful gathering including how we prep our food and house. This post is dedicated to the centerpiece of most gatherings, that around which friends and family congregate and celebrate – the food! Here are some practical considerations for formulating a menu. What food is affordable/accessible/in season? While steak might be your specialty, it is not very affordable for a crowd. You also have to consider if specialty ingredients are available (there are some things I don’t make when I’m in Winter Haven because I can’t find the ingredients). And remember – seasonal is cheaper. What are you good at cooking? Don’t try a new recipe when you are serving a crowd or hosting a party – it adds an unnecessary layer of stress. Do your guests have any food allergies/dietary restrictions/preferences? It may be necessary to modify recipes or leave things out, depending upon your guests. How many people are you feeding? The more people, the easier your menu should be to prep ahead and serve. What time of day is the gathering? Do you need to serve a full meal? Mid-afternoon or late evening gatherings may be fine with just snacks or dessert. How much time can you dedicate to food preparation? If the answer is “not a lot,” don’t plan fussy dishes with lots of steps. Take help from the store with pre-prepped ingredients or order the main course and focus your time on sides and dessert. How much space do you have in your oven/on the stovetop for various dishes? If your oven only holds two casserole dishes, don’t plan for more than two oven dishes at your party. Or plan to stagger the cooking but make sure you allow enough time to cook everything and get it to the table hot. These can all be considerations that factor into what you choose to prepare. Below are some examples of party menus we’ve had and the rationale for how we chose that menu. When we are having a gathering in someone’s honor (baby shower, engagement party, wedding shower), we try to let the preferences of the guest of honor dictate the menu. For Casey and Anna’s baby shower, the mom-to-be requested homemade mac and cheese. 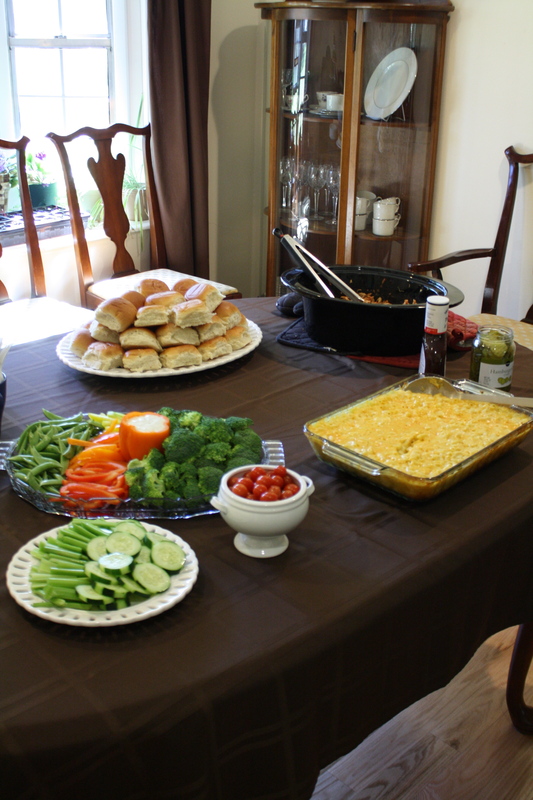 Since homemade mac and cheese was the centerpiece of the meal, we rounded out the table with a low-maintenance main dish (crockpot bar-b-que chicken) and healthy, easy to prep sides (veggies with dip). And, of course, cupcakes for dessert. This is the same menu we prepared for Josh and Kari’s baby shower and one that I think works really well for couples showers – there is no place for fussy finger sandwiches and macaroons when menfolk come to a baby shower. Shannon and I co-hosted a party for the premiere of the final Harry Potter movie. The menu was a bit more elaborate than usual but fit with the theme. 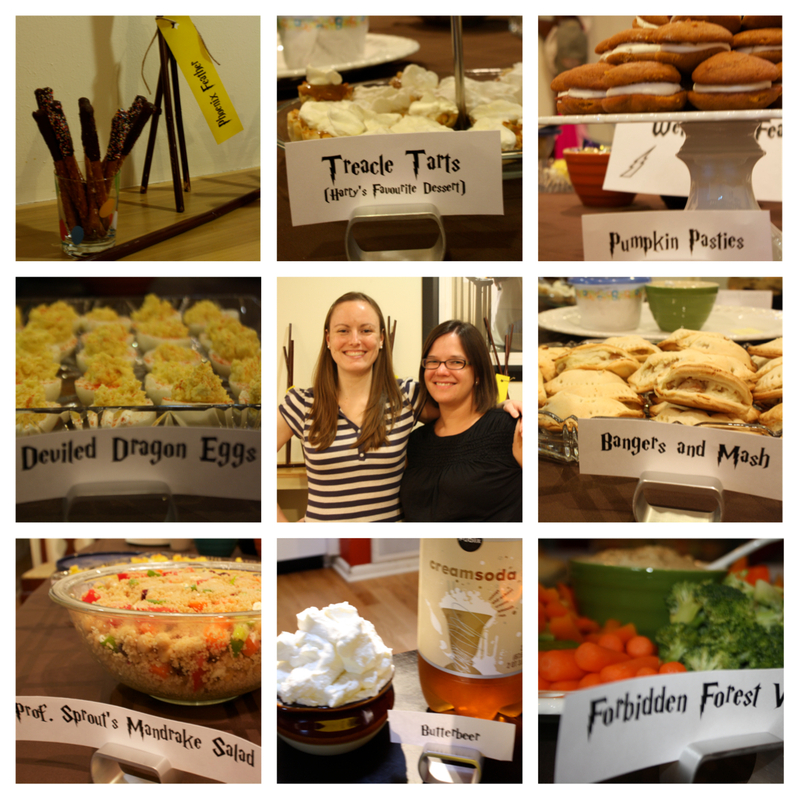 We tried to incorporate food from the book into our menu, which made it both eclectic and fun, but we also had some party staples which we gave creative names based on the book. From the book, we had Bangers and Mash (mashed potato and chicken sausage hand pies), treacle tart (bite-sized banana cream and toffee tarts), pumpkin pasties (mini pumpkin whoopie pies), and butter beer (cream soda with whipped cream). We also had deviled eggs (Dragon Eggs), veggies with dip (Forbidden Forest Veggies), couscous salad (Mandrake Salad), and chocolate dipped pretzel rods (Magic Wands). For Artie’s 30th birthday, we hosted a cheese tasting. 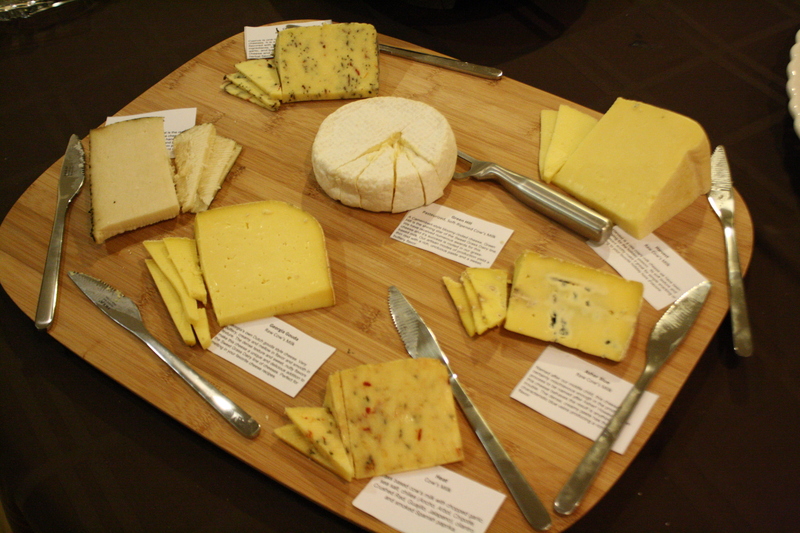 The main feature of the party was the cheese board which had a yummy spread of Sweet Grass Dairy cheeses. We served these with lots of little bites that go well with cheese: (clockwise from top) smoked almonds, dried apricots, assorted crackers, veggies, fresh bread with garlic olive oil, smoked sausage, and apples. 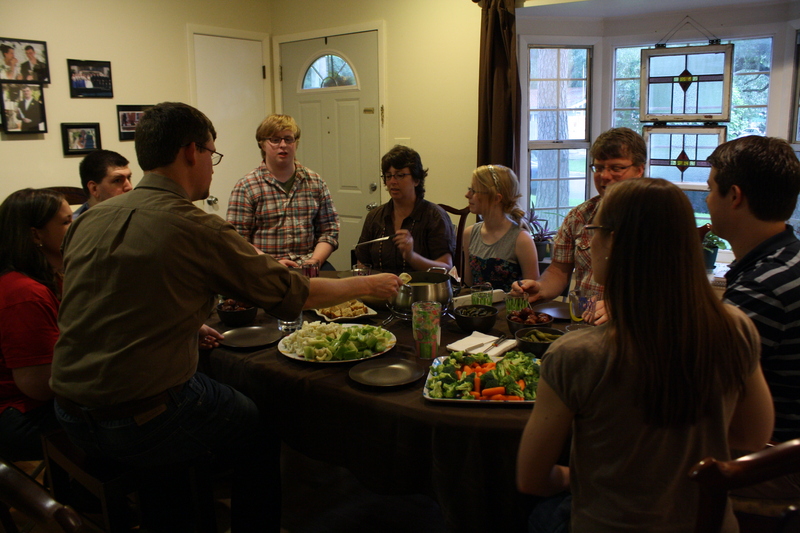 While we did not intend for this to be a dinner party, there was more than enough food for everyone to get their fill. 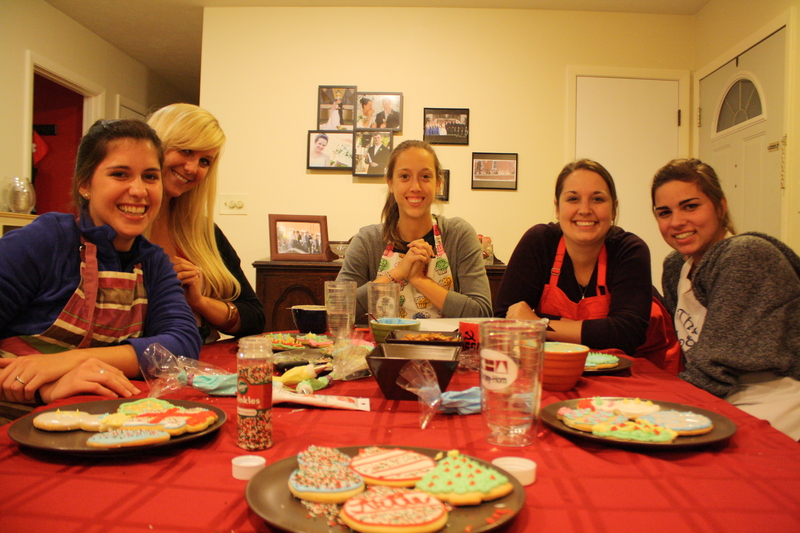 One holiday, I invited my Scholar mentees over to decorate cookies and enjoy some girl time. To save myself some time and trouble, I bough undecorated sugar cookies from Tasty Pastry in town and just whipped up my own icing (the recipe couldn’t be more simple – powdered sugar, water, and food coloring – that’s it!). I also make sure I had plenty of sprinkles on hand. I wanted a few snacks on the table so we weren’t tempted to chow down on our cookies before they were finished, so in the middle of the table I had peanut butter pretzels and white chocolate covered holiday pretzels. It was a fun night with minimal prep and maximum laughs. 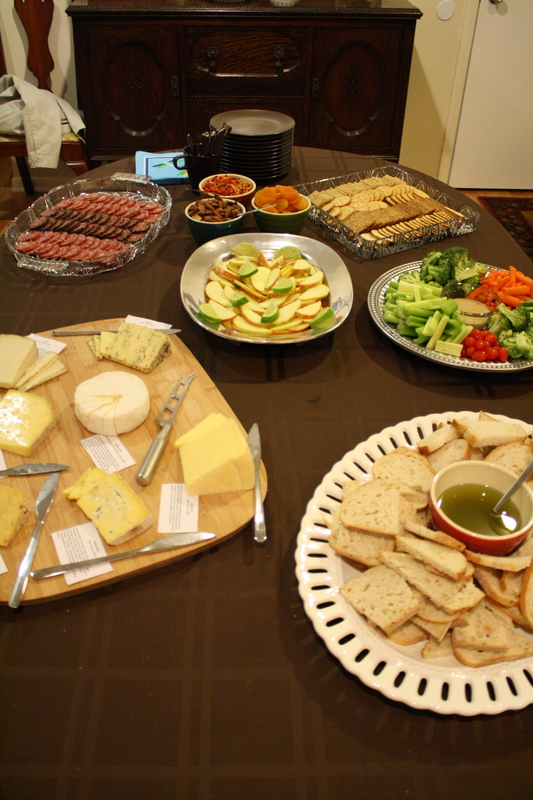 When we had our Community Group from church over for fondue, we made it a potluck of sorts – we made the Swiss cheese based fondue and the guests brought the dippers: hunks of crusty bread, baby pickles, an assortment of vegetables, and smoked sausage. 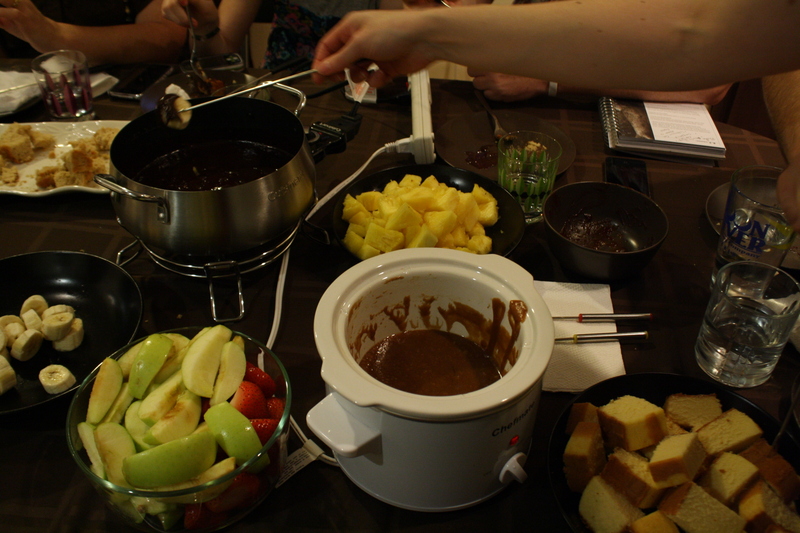 We did two types of dessert fondue: chocolate and caramel. Into these, we dunked hunks of pound cake, marshmallows, and assorted fruit (pineapple, apple, banana, and strawberries). It was a very different meal because every one was gathered around one table rather than making a plate and going to the living room, but it was fun and make for lively conversations and trying not to stab each other with fondue forks as we reached across the table for dippers and fondue. 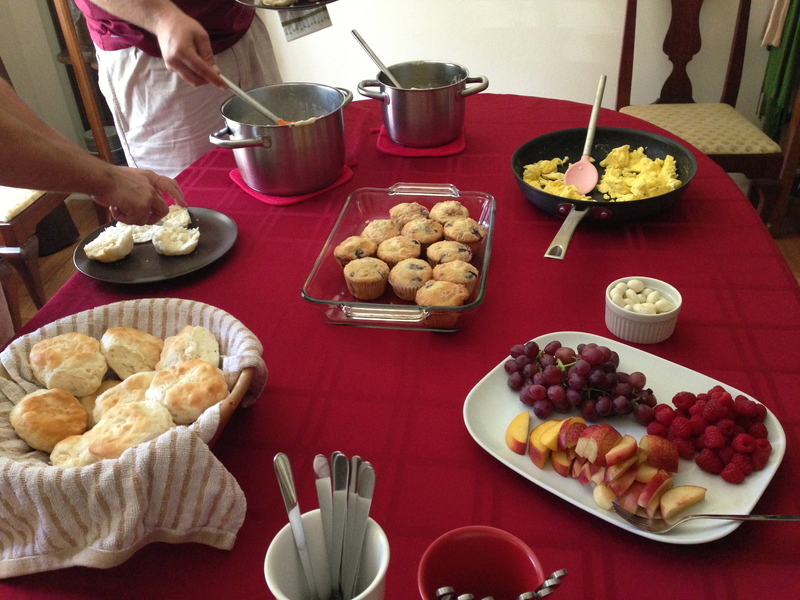 When my family came over for brunch a few weekends ago, we went with something simple for a crowd (my family is 9 people, counting Artie and Lindsay) and wasn’t too high maintenance the morning after a late night football game. We ended up with biscuits (from the freezer section at the grocery story – don’t tell my family! ), sausage gravy (one with turkey, one with pork), eggs, fruit, and yogurt-covered almonds. Lindsay brought blueberry muffins to round out the meal. Another good option would have been breakfast casseroles, prepared the day in advance. Not too high maintenance, but a filling brunch. So there you have it – a few menus and our rationale for planning them that way. I wish I had more pictures/could remember more menus because I know we’ve had more parties than this. It goes back to what I said in the last post about remembering to take pictures at your party! So even if planning a good party menu sounds intimidating, if you consider the questions at the beginning of this post, you’ll be well on your way to planning a delicious and achievable party menu.